With the release of “SPY”, 20th Century Fox is putting out it’s second spy genre film of 2k15 with the first being the hugely entertaining ‘Kingsman:The Secret Service‘. But Melissa McCarthy’s latest jaunt into comedy had me contemplating if it was just going to be another one where she wears out her welcome by playing the same character-type once again. I’m pleased to report this is not the case and you will find yourself laughing your way through this one. Not only because of the fact that McCarthy is more or less doing character assassinations on most of those stereo-typed characters of her past, but it’s with a strong supporting, hugely funny and entertaining cast which really pulls this film all together. McCarthy plays “Susan Cooper”, a deskbound CIA analyst acting as the eyes and ears for expertly named-and-trained field agent, “Bradley Fine” charmingly done here by Jude Law, with whom she is clearly head over heels for, this fact being advantageous for him. When Fine goes missing and the agency is compromised, CIA spy-team leader “Elaine Crocker” (Allison Janney) gives the unassuming Susan a shot at her first field mission to infiltrate the world of a deadly arms dealer. Needless to say, things do not go as planned. Not only does she have to deal with exotic uber-vixen “Raina Boyanov” (Rose Byrne) who has a hilariously homicidal lack of tolerance towards her own henchmen, but her own fellow on-the-outs disgruntled agent “Rick Ford” (Jason Statham) who is essentially part Rambo, part bumbling Inspector Clouseau. Every scene between McCarthy and Byrne sparkles and both play their roles spot on, particularly when they are both aggressors. Not content to be mere supporting actresses, both Byrne & Janney have some of the funniest lines in the movie. The jokes come so thick and fast that you’re likely to miss some of them simply because they’re drowned out by your own laughter along with the audiences. 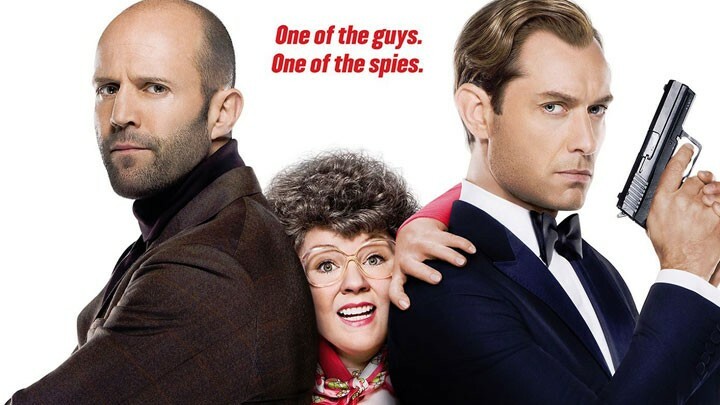 Statham is hilarious and is one of the reasons I wanted to see this film so much as seeing him skewer his tough-man persona, swearing poetically and prat-falling left and right in the most unpredictable spots is just one of SPY’s fun delights. My only beef with his part is I wanted more. 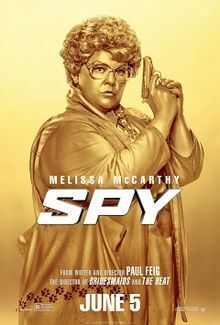 Spy would not be funny if it were simply Susan/McCarthy bumbling from one scenario to another. It helps that her characters here have vulnerabilities; it works because McCarthy is adaptable to every situation she finds herself in and is able to hit all her marks without a miss. There’s a sense of witnessing a woman empowered and it’s a hoot to see McCarthy given the space she deserves here. 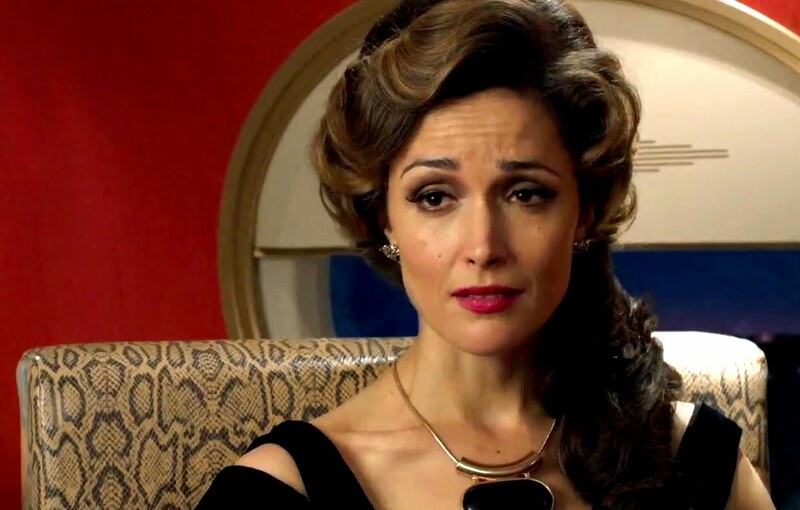 The other is watching Rose Byrne vamping it up as Rayna Boyanov, along with Miranda Hart, who is a constant surprise as Susan’s coworker “Nancy“. And then we have 50 Cent, as himself, having a grand old time being, yes, dare we say it, a tad bit funny..
Director Paul Feig has gathered a game cast here who are more than committed to the faintly ridiculous material they’ve been given which will make Spy likely to be one of the funnier films of the year. 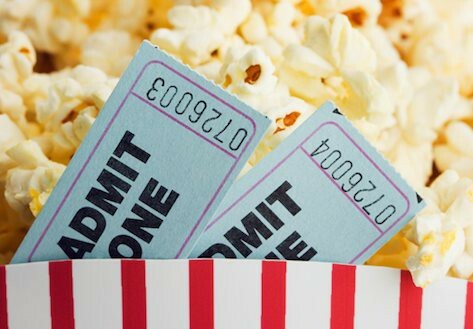 There are films with stronger action sequences, but that won’t be your concern when watching as again, you’ll probably be to busy laughing. Great minds think alike! I was a bit surprised by this, especially after a slow start, But this ensemble, especially Byrne and Statham, killed it. Great analysis.